Hatters striker Craig Mackail-Smith admitted his side are more interested in finally putting together a consistent of form than discussing whether they can reach the League Two play-offs this term. Luton head to struggling York City this afternoon, trailing the top seven by a hefty nine points and will need to go a lengthy unbeaten run to even come close to prolonging their season. 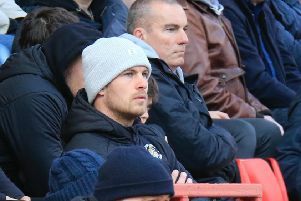 Mackail-Smith said: “I don’t think we’ve talked about any of it really, literally we are just taking it game after game. “Because we win a good game and then we seem to lose a game, then we seem to get a draw and a win. We don’t seem to put any consistency together. “So there hasn’t been any talk. We need to game by game and see where we are at the end of the season. The striker had been left on the bench for the victory over Pools, but came on with 10 minutes to go to net the winning goal. On not starting, he added: “We’ve got a lot of options to choose from. The gaffer picks the team and how he feels we should set up and its not done too badly at the moment.